To allow members of Congress to focus on the economy, North Carolina Democrat Governor Beverly Perdue has proposed suspending congressional elections for two years. Trial balloons, like Democrat Party talking points, are coordinated. The Democrat governor released her Party’s trial balloon yesterday while discussing the economy at a rotary club event in Cary, North Carolina. Suspended elections occur in third-world countries once the dictator and the regime realize the country’s electorate intends to oust them from power. Obama’s plummeting poll numbers and the Democrat Party’s loss of Weiner’s seat in New York have unhinged the statist Democrats. The Framers’ checks and balances to limit government power were designed to frustrate the aims of a dictator. The 2012 elections could thwart Obama’s plan to transform America, but suspending the elections would most certainly negate interference from the electorate and keep his collectivist dream alive. For more on the story, see NC governor recommends suspending democracy to focus on jobs, Perdue jokes about suspending Congressional elections for two years, Too Much of a Good Thing, or click here and listen to Perdue’s proposal to suspend Congressional elections. Nothing has changed with regard to the fundamental reasons for buying gold. The thesis remains 100% intact. Hedge funds in the past week have been selling off their positions, causing a temporary price decline. These are short term traders who commit billions of dollars of other people’s money based upon formations on a chart – not sound reasoning. A “strong dollar” is a complete misnomer. Picture a teeter totter on the deck of the Titanic. One can be “up” versus the other; however, the problem with all fiat currencies is the same. Which is “up” versus which on any given day is irrelevant in the longer term. By “longer term” I’m talking months – not years. The greatest risk ultimately is being long fiat paper backed by the utopian fantasies of prodigal governments. You have to be long gold. The dollar has lost 96% of value versus gold and will eventually lose the other 4%. To mitigate volatility, as a means of diversification, I like the utility ETF – Select Sector SPDR-Utilities (Symbol: XLU) yielding over 4%. The treacherous policy of the Fed is creating a bubble in junk bonds as it appears the only option for seniors looking to replace the yields of their maturing CDs. I do not like the junk bonds or any bonds right now. I expect bonds and bond investors to get destroyed as the government is forced to “inflate their way out of the debt”. Millions of senior citizens will fall prey to brokers all too willing to sell them the junk bonds and leveraged funds. I think the equity offered in the utilities with the dividend yield is a better place to look for current income/yield than bonds. Sure, you could go out and buy one utility alone and get a higher yield –but- the ETF provides important regional diversification. This is important in this economic climate. I also love Microsoft here. I have rarely been excited about MSFT but here at this level, selling at a mere $200 billion market cap – it is a fraction of its former high of $614 Billion, 9 times earnings and a solid 3% + dividend. As when I was recommending Ebay at around $12.00 (2/23/2009) – my thesis was that the sum of the parts were worth far more than the market was – temporarily – appraising the whole. I concluded the rapidly growing PAYPAL which is owned by Ebay was worth more than the current price of Ebay; thus it was only a matter of time before the value was FORCED upward by the growing cash flow and EPS. I say the same for Microsoft (MSFT) here at the $25 dollar per share/$209 billion market cap. I can envision a future where their prudent acquisition of Skype may prove to be a Bonanza. Based on what I’m seeing from Skype, I believe that Skype has the potential to be worth $200 billion alone in a few years. You must own gold. To help offset over-all volatility, value and cash flow can be found in the utility ETF (XLU) -and- Microsoft is a compelling valuation here with a built in floor of cash, cash flow, low p/e and attractive dividend. Then keep up to 25% in cash for the short-term needs. I recently attended a dinner discussion sponsored by the Pennsylvania State Education Association. The title of the discussion was based on the African proverb “It takes a village to raise a child.” Excerpts from The Dream Catcher were read at various intervals throughout the evening. The story’s tenor suggests that children’s needs are better enhanced through a community effort. The story purports there is a natural symbiotic relationship between a child and its community. The notion that a child draws its happiness and well-being from the community, while the community grows stronger through sustaining and nurturing the child, is the underlying principle of socialist societies, and not in societies whose foundation is based upon individual rights and popular sovereignty. It seems that modern American educators no longer understand the philosophical basis for the American Revolution. The philosophical basis of the modem world was carved out in 1776 and 1789 during the American and French revolutions. Although both revolutions occurred in a little more than a decade of each, other, and each involved the overthrowing of a monarchy, they were worlds apart in their philosophies of understanding government and human nature. The political ideas of the men who laid the foundation of the U.S. Constitution came indirectly from John Locke. The belief in Lex Rex (Law is King), or as we know it, the idea of “inalienable rights” is the founding principle of American government. The underlying notion of this principle is that man’s rights are endowed by his Creator, not by the state. In other words, man’s inalienable rights to life, liberty and the pursuit of happiness are given by a Supreme Being, and not by the state, and therefore cannot be taken away. Rousseau believed human beings could be molded and shaped by the general will once society’s old ideas and institutions had been eradicated from it. His aspirations were utopian in that he believed in man’s perfectibility. According to Rousseau, man’s potential for moral change is essentially unlimited, and it is up to the naturally virtuous human beings to transform man from what he is to what he could and should be. Rousseau’s utopian aspirations were adopted by some “naturally virtuous” human beings during the French Revolution. Rousseau’s utopian ideals fueled the tyranny of Robespierre’s Reign of Terror, which eventually led to the authoritarian reign of Napoleon. Conversely, the United States has never been subject to a dictator. Locke’s idea that human nature is neither perfect nor perfectible is expressed in the Constitution’s system of checks and balances, which were included for both the governors and the governed That system has worked because it took into account man’s moral and mental limitations, which were based on a theory of improving the human condition, not perfecting it. The United States was never intended to be a utopian motherland or “workers’ paradise” ruled by an Aryan superman, or managed by a “new Socialist man.” Our forefather’s envisioned a liberal democracy based on majority rule, individual rights, and limited government. The Founding Fathers did not want to possess a man’s soul or psyche, in fact, they wanted to do the exact opposite. They created a system of government that gave the individual the freedom to pursue his own interests, hold his own opinions, and live his own life. America’s educators need to rethink what it is -they are doing in their classrooms. Students are without a national identity because they have not been taught what it is that distinguishes America and sets it apart from other nations. ‘They have .also been fragmented into groups, and set adrift in a sea of cultural diversity without a sail or a rudder to steer by. Their belief in national sovereignty has been uprooted and transplanted in a global community. If America’s educators believe in those principles of national sovereignty and individual liberty as penned in the Declaration of Independence and the Federalist’s Papers, then they must realize that they are obligated by the Constitution to teach those ideals to their students. On the other hand, if America’s educators are utopian socialist engineers working to transform the United States from what it is to what it could and should be, then their hallowed halls and ivory towers have become nothing more than a breeding ground for socialist utopians. The premise that it “Takes a village to raise a child” is a purely socialist concept. Americans have always understood that the responsibility for raising children belongs to the child’s family, and not to a community or a coalition formed by the Pennsylvania State Education Association. Members of the PSEA surely know that the fabric of American society is weaved around the family unit and parental authority, unless of course their goal is to lay a different social foundation based not on individual rights and parental authority, but on the rights, responsibility, and general will of the community. NOTE: This commentary appeared in Mainline Newspapers in 1998. In the 7:07 video below, Judge Judy questions defendant Duane Brooks, Jr. about his use of government subsidized rent money for personal expenses and not for rent. Brooks, who says he’s been attending college for three years collecting stipends, subsidies, and assistance seems to think that he’s entitled to tax-payer money and doesn’t have to use it for its intended purpose. Brace yourself as you watch a college student, weaned on government handouts, try to get his mind around the Judge’s charge that he’s scamming the system. The :26 video below shows Michelle Obama’s obvious distain for the “Stars and Stripes” as it’s being folded by police and firefighters during a recent ceremony honoring those murdered on 9/11. Ms Obama appears to say, “All this for a flag,” before pursing her lips and shaking her head from side to side as the Ruler nods. In truth, both the Ruler and his rancorous wife are embittered leftist outsiders who really hate America and want to fundamentally transform the Republic into a democratic socialist state. For background information on the story, see Obama’s women reveal his secret. The mini-billboard cover featuring a story celebrating the repeal of the military’s “Don’t Ask Don’t Tell” (DADT) policy and the views of homosexual Marines will be displayed worldwide on Marine Corps bases in heavily-trafficked areas including commissaries, offices, and work spaces. In less than a week, the Marine Corps will be forced to abandon its DADT policy and start enforcing policies that embrace and protect open homosexuality. As they did on college and university campuses, politically-correct policies will distinguish between homosexuals and heterosexuals, thereby creating a protected class empowered with special privileges and treated more equally than others in the non-protected classes. For more on the story, see Marines’ DADT Countdown: “We’re Gay. 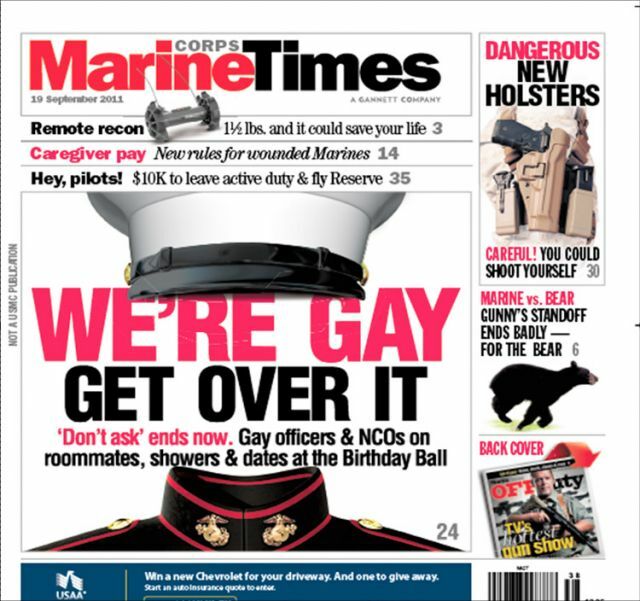 Get Over It” and SU Members in MARINE CORPS TIMES Cover Story. Our friend Quin Hillyer now hosts a weekly radio show on FM Talk 106.5 in Mobile, Alabama. Quin’s a “righteous dude,” and I encourage readers of The Millstone Diaries to bend an ear and give him a listen via the Web at http://fmtalk1065.com/. “Hillyer Time” airs Thursdays from 9-10 EST. Quin Hillyer is a senior fellow for the Center for Individual Freedom and a senior editor of The American Spectator, and a former editorial writer and columnist for the Washington Times and the Washington Examiner.